External DVD drive is a great solution if you own a netbook or your PC has a broken built-in DVD drive. The best external DVD and CD drives are compact and lightweight, so they won’t take much space in your bag but will be a great bonus for your 2-in-1 laptop or gaming PC. Here’s the list of options and features you should always take into account in order to choose the best external DVD drive for your device. When you consider the speed of an external DVD drive, pay attention to both write and read speeds. Another feature to take into account is USB version. It’s always better to choose an external DVD or CD drive which supports USB 3.0. Such drive is faster than those with USB 2.0 but at the same time is also backward compatible with the older USB versions. Almost all external DVD drives are compatible with popular operating systems such as Windows or Mac. Still, remember to check whether it is compatible with the version your OS has. Some of the external drives do not support the latest updates. Besides, not all of them play Blu-ray. Modern external DVD/CD drives are quite compact. Still, there are some products which can be hardly called portable and usually stay at home even if their owners need them on their business trips. It’s always better to choose a slim and lightweight drive which can be easily put into your bag. This feature is very important for those who don’t like being disturbed by the annoying sound of the drive reading a DVD. Some of the best external drives include noise reduction technology which guarantees quiet performance. Though a lot of DVD drives may seem to be very fragile because of their small size, the best external DVD/CD drives have a solid build. Even if a unit is made of plastic it can be still durable. One more thing that you should pay attention to is whether a drive has a fingerprint-resistant housing. Of course, it’s a kind of very small nuance, which doesn’t affect the performance, but it does matter as no one likes dirty things. Modern external DVD drives do not require an external power source. The point is that lots of computers have enough power for an optical drive, so you will need only one cable for its work. In case a computer is old you may need an extra Y-cable. If you’re looking for a high-quality external DVD drive, though we know this type of gear is somewhat obsolete in the “current year” with USB 3.1 and all that, the LG Ultra Slim would make for an interesting choice for a number of reasons. First, it looks awesome, and it’s manufactured by one of the world’s leading tech companies. 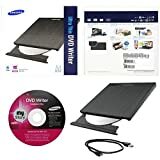 Okay, that’s not a “valid argument” for geeks, but how about this one: 8X USB 2.0 Super Multi Ultra Slim Portable DVD Writer Drive +/-RW External Drive with M-DISC Support. So, we have portability in a cool looking/compact form factor, everything for under $30, which is kind of awesome. Speaking of portability and cool design, the LG Electronics Super Multi Ultra Slim is just 14mm in height, which means it’s pretty inconspicuous around your gear (laptop or PC). Also, the USB 2.0 interface, though kind of obsolete, still provides solid transfer speeds (480 MBPS), while the DVD drive is USB 3.0 compatible. We know, it’s not much, but it’s enough for most people. For Linux OS consider Pioneer BDR-XD05B. This portable Blu-ray burner has USB 3.0 interface what guarantees fast performance. Another bonus is its power lines. USB 3.0 means that there is no need for 5V power adapter or extra USB connector. Besides, it consumes less CPU power for data transferring as it has a larger packet size. Pioneer BDR-XD05B is provided with PowerDVD, which will save your money as you won’t need video player software. By the by, this external drive has a standard USB Mass Storage protocol with MMC-5 SCSI command set. For a reasonable price, ASUS ZenDrive offers 8XDVD write speed and M-Disk format support, which is designed to protect you from memory degradation and data loss. This external DVD optical drive is ultra slim and has USB 2.0 interface. It has a stylish design thanks to a concentric-circle hairline finish. 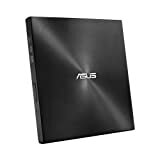 ASUS ZenDrive is compatible with Windows and Mac OS as well as Nero BackItUp for Android devices. Its bundled Cyberlink Power2go 8 software guarantees a simple backup solution and provides optional encryption of your data to save your privacy. There is also an online backup solution for such devices as tablets and smartphones. 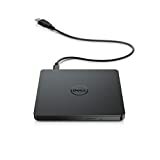 Another ultra slim external DVD drive is Dell DW316. It includes pre-loaded CyberLink Media Suite for easy DVD/CD play and burn as well as an installation of disc-based computer programs. It has 24xCD and 8xDVD read speed. 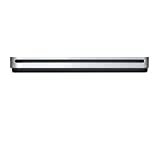 Dell DW316 External Optical Drive is powered by your Ultrabook’s or notebook’s USB port. It means that you won’t need any batteries or power cords. It is compatible with Windows and Mac operating systems. The only drawback is that this optical drive doesn’t play Blu-ray. This Blu-ray burner supports USB 3.0 which means it can offer you a fast performance. Pioneer BDR-XU03 includes PowerRead Smooth and PureRead 2 Smarter Media Playback. It is provided with 128 GB quad layer and 100 GB triple layer Blu-ray media support. Pioneer BDR-XU03 is designed with a magnesium body to make it more durable. In addition to this, it comes with an auto quiet mode for silent performance. One more representative of the best CD and DVD drives is Apple USB Superdrive. Its portable design is great for mobile workstation. Having this external drive you will be able to play and burn CDs as well as DVDs, create backup discs and install program software. It’s also highly compatible and supports MacBook, MacBook Air, iMac, Mac mini, and others. Keep in mind that there is no extra power adapter as its work depends on your Mac battery power. If you’re a Samsung fan with fifty bucks (or more) to spend on an ultra-portable external DVD drive, this Samsung may have your name on it, and for good reason. Even if this DVD drive sits on the “expensive side of the force” compared to the LG, i.e. it’s almost double the price, the build quality is exceptional, and, very important for Mac users, the DVD drive is instantly recognized (as in out of the box), i.e. it’s a plug and play job, regardless of the machine, as in there are no firmware updated required for boomer-tech users. Basically, if you’re looking for a sleek and portable external DVD drive from a reputable manufacturer, look no further than this one. This external optical drive comes with a new TV-linkable feature which allows USB-enabled display devices such as televisions or media players to read discs without a PC. HP External DVD/CD Drive is designed with the newest optical storage technology that provides fast recording. In case your computer has Windows OS keep in mind that you can use Cyberlink Media Suite for your multimedia content. This HP DVD600S has an ultra-thin design due to which its portability is great for mobile workstations. As well as the pre-cited external CD/DVD drive this product is powered by the USB port, so you won’t need to buy an external AC adapter. Its USB 3.0 interface guarantees fast performance and great burning experience. Patuoxun External DVD drive is suitable for various devices and operating systems including Windows and Mac OS. Still, keep in mind that this external drive isn’t compatible with windows 10 or new Macbooks without a direct USB interface. By the way, Patuoxun External DVD drive comes with a powerful error-correcting ability, anti-shock and noise reduction. Whatever external DVD drive you will choose, make sure it’s the best product namely for your device and you as a top-notch drive will be a great addition to your device. I have a Win 10 computer and want to buy a macbook air. Is there any player that can switch my files on one to the other? I’m not sure I understand what you mean by a “player”. You can use DVD drive to copy your files to DVD. You can transfer the files using cloud storage (will be too expensive if you plan to move a lot of files). You can also use a flash drive or even external hard drive for that task. So none of these PLAY dvds???? You’ll be able to access the content on DVD and play whatever is there. the apple one? most of the reviews on the apple website are 1 or 2. main problem is said to be no way to ejext disc and it stops working aftwr a while. are there others that work well with an imac? not criticizong you, just surprised.